An international criminal tribunal convicted two aging former Khmer Rouge leaders in a historic ruling that for the first time legally defines the regime’s crimes as genocide. 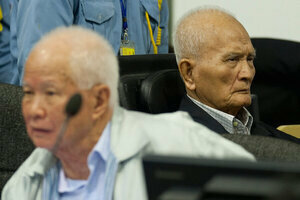 The defendants, Nuon Chea, 92, and Khieu Samphan, 87, are among the last surviving chieftains of the Khmer Rouge, a brutal regime that decimated Cambodia from 1975-1979 in an effort to recreate a utopian agrarian society. An estimated 1.7 million people—or more than 20% of the population—died. Despite their blood-drenched pasts, neither Nuon Chea, who was described as the “loyal right-hand man” of Khmer Rouge leader Pol Pot, nor Khieu Samphan, who served as head of state, were previously charged with genocide. Posted in Misc and tagged Khmer Rouge, Pol Pot at 3:10 pm on November 16, 2018 by Bodger. The title of the piece did make me laugh….horrific subject matter though. It’s funny how most of these extreme socialist utopias result in massive loss of life and bloodshed. From the Soviet Union and the Eastern Bloc, Maoist China, Venezuela, Cuba et cetera.It’s a little surprise that some of the most right-wing governments in Europe come out of former Soviet states. Any political ideology is toxic when taken to its extremes continuously. And yet every socialist you come across will tell you that all those atrocities weren’t real socialism. Stalin, Mao and Pot weren’t the real deal…apparently. Read some books and learn the difference between socialism and communism as well as moderation and extremism. Communism is a ‘tool’ or ‘mechanism’ to achieve socialism , neither the soviet union or Cambodia achieved socialism , and probably wouldn’t have considering the way they went about it. The Khmer Rouge considered that the ‘middle class’ were a dangerous group , they would frustrate any effort to change the country for the better , so they decided to kill them all. One of the most frightening things they did was the invite the middle class, doctors dentists, academics, etc to come home and help rebuild the country , they did, and the Khmer Rouge kill them at the airport …. and in this case the ‘middle class’ we right , however , before I knew any of that I had come to the conclusion that in Ireland its the middle class that have been frustrating progress in the country for decades , thankfully we are a more reasonable people…. Will Michael D Higgins write character references I wonder? They are fellow travellers of his. Martyrs in the fight for a more equal society. Any knowledge about our President or even some casual research into him would show quite the opposite. Stop trolling, you prick. The US killed twice that in Vietnam. Vietnam War killed 3.8 million Vietnamese, not 2.1 million? Reuters reports a new study published in the British Medical Journal finds the Vietnam War led to the violent deaths of 3.8 million Vietnamese between 1955 and 1984, rather than previous estimates of 2.1 million. Firstly, it’s not a competition. Secondly, the 3.8 is total dead so no necessarily all due to evil America. Senegal? Lichtenstein? Moldova? The Cook Islands? Are you under the impression that the Vietnam War was fought between the US and Vietnam? The South Vietnamese had over a million combatants on the field towards the end of the war. Those two should be given a slow death similar to those they had tortured & then butchered. are you volunteering to torture them? Absolutely. I’d just google what methods they used. The slower the death the better. Went on holiday there once with the wife. Mass murder in the name of Utopia it was for sure.